This IWB resource is a bit of a departure from the others and really only works as part of the Mission to Mars theme of the last few resources posted. There are more details on how this resource is intended to work and how it fits into the sequence of themed lessons in this post on the supporting site teacherledplus. In essence this resource is intended to challenge childrens teamwork and communication skills as part of a series of lessons themed on the a mission to mars. 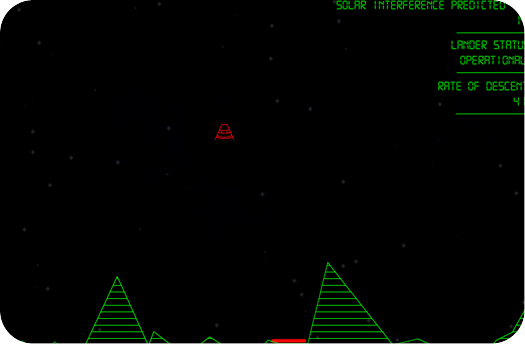 It is based on the classic Lunar Lander game but requires 3 players. One to control left, one to control right and one to control thrust. (Q = Left, P = Right and Space = thrust). It attempts to emulate the scene in Apollo 13 where the crew each need to manually control one aspect of the craft’s controls to correct their line of travel. In this challenge the craft needs to be landed on the spot designated by the red line. Hazards include the gravity, the ground and the ever present threat of solar interference. A good way to use this resource is to allow children to practise at a computer and then perform “for real” at the interactive whiteboard. This is a very tricky challenge but is definitely possible (it is easy for a single person but used as designed for a team the challenge becomes apparent. It requires the children to work out a clear and concise system of communication and to work as a team. For demonstration purposes the arrow keys can be used but you should insist that for the challenge each member of the 3 person team uses can only use Q, P, or Space. More details on this and the rest of the Mission to Mars resources can be found here. Go to the interactive whiteboard resource. As this is a bit of a departure from the usual purpose of my IWB resources please let me know whether you feel it could be useful for your class or, if you do try it, say how it went. Comments can be left below.